Mozilla pushed the next version of Firefox 19.0 to release channel. 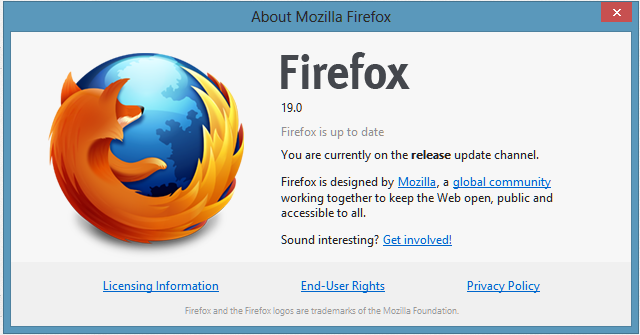 Firefox 19.0 came with startup improvements, It is not yet available on Mozilla website but available on Mozilla FTP servers. As per the beta web page release notes, The firefox 19.0 has new built-in PDF reader, Firefox 19.0 is also features speed improvement and improvements for developers. Whenever the user opens a pdf document in the browser, it will be opened directly in its built-in reader. However the user will get options to change to other reader. Download Firefox on Mozilla FTP Server.